The following is a transcription of the Wilson Estate Cemetery located between Falkland and Westwold, British Columbia, Canada. 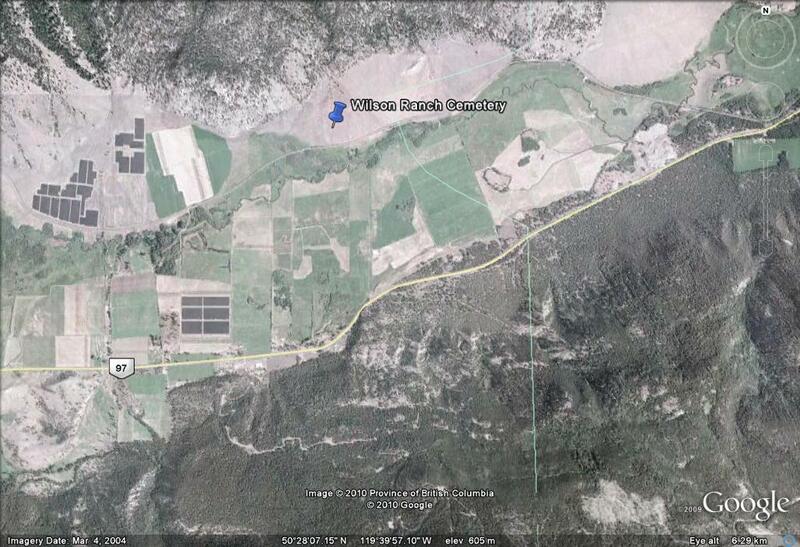 Latitude: 50o 28' 45.60" N.
Longitude: 119o 40' 25.47" W.
The Wilson Estate Cemetery is a private family cemetery. John Wilson, stockman and entrepreneur, pre-empted 160 acres of land in 1864. He purchased more acreage in the sixties' land boom, and although his holdings grew to 1200 acres, he never actually lived on this land. His home ranch was at Savona and later Cache Creek. 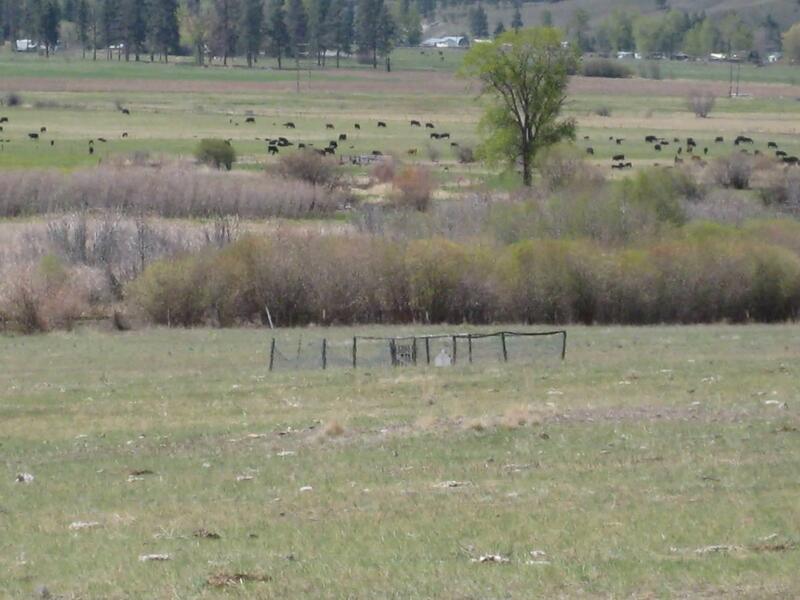 His Westwold property provided valuable feeding and breeding ground for some of his cattle and at one point, pigs. At his death in 1904, the rents and profits were divided equally among his son, William and his daughters, Lizzie Willard and Duckie Gannon Ward. The land itself was held in trust for John Wilson's grandchildren. 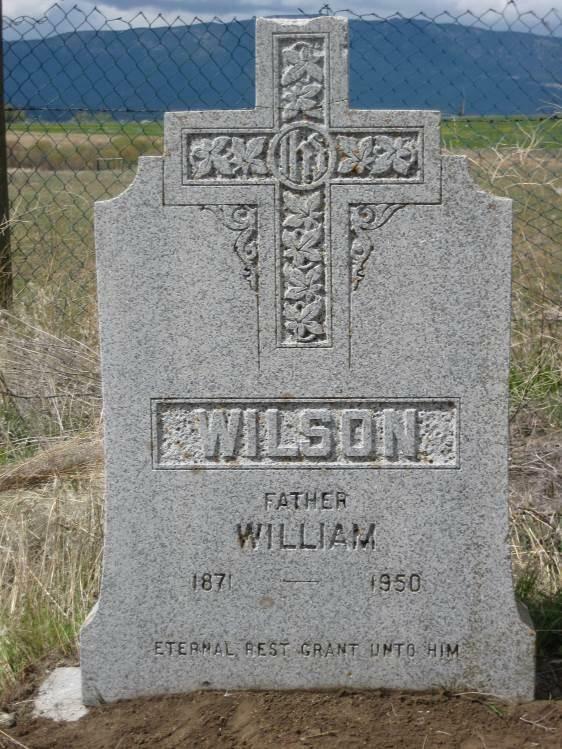 William died in 1950 and he is buried in this family cemetery along with his infant daughter, Edith Louise Wilson, who died in 1907. Also in this plot are other graves. It is not known for certain who they are but William, his daughter Edith and a granddaughter Simpson are at rest here. The cemetery is located halfway between Falkland and Westwold on the north side of the Highway 97. At one time, this was the Wilson Ranch property but has since been sold. 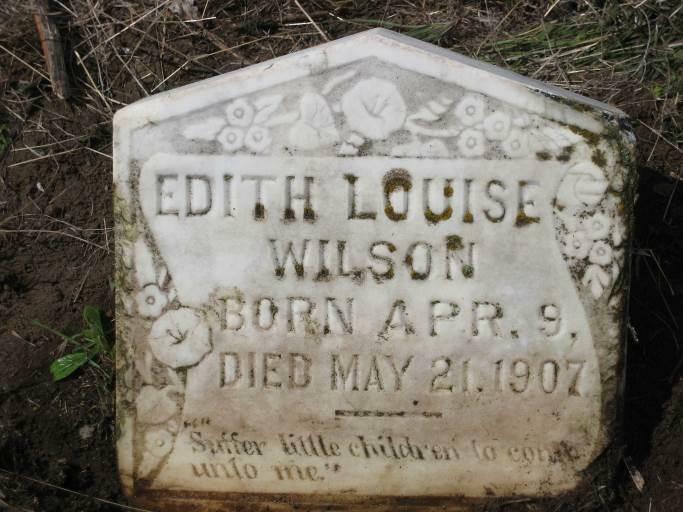 The Wilson Estate Cemetery is in the middle of a pasture and is not well maintained. It is approximately 15' x 25' enclosed by wire fence. There is a wooden pedestrian gate at the entrance. It is unknown how many are buried at the cemetery as only two markers are visible. The Wilson Estate Cemetery is located on private property above the railroad tracks. It is not accessible from a public road. Please, note: Permission to visit will be required from the owners. Benedict, Fay. Interview. May 2010. Culling, Dolores (Falkland Historical Society). Interview. May 2010. Selody, Marjorie M. Meeting of the Winds, A History of Falkland. 1990.